Reports that autoimmune encephalitis (AE) is associated with antibodies have increased; however, little is known about the distribution of clinical symptoms, imaging changes, and prognostic factors in patients with AE of non-neoplastic etiology. Accordingly, we evaluated the clinical characteristics and factors associated with short-term prognosis. From January 2016 to June 2018, 31 adult patients were diagnosed with AE of non-neoplastic etiology at Shengjing Hospital of China Medical University and their demographic and clinical characteristics were abstracted. Factors affecting disease severity and predictors of prognosis were analyzed. 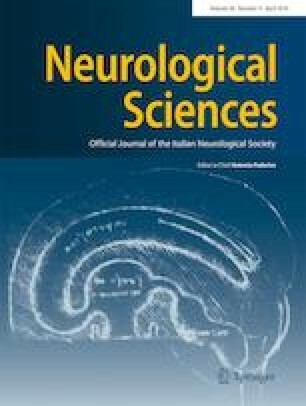 Among 31 patients, 19 had anti-NMDAR, 5 had anti-GABABR, and 7 had anti-LGI1 antibody encephalitis. Status epilepticus, ataxia, and cognitive dysfunction were the most common neurological symptoms. Deep white matter (DWM) abnormalities were the most common changes observed on MRI. Logistic regression analysis indicated that conscious disturbance (odds ratio = 11.67, 95%, confidence interval 2.13–64.04; p = 0.005) is an independent factor associated with poor prognosis in AE. The clinical manifestations of AE are diverse; status epilepticus, ataxia, and cognitive dysfunction are most common. The DWM of the brain, rather than the limbic lobe system, was most prone to MR signal abnormalities. Conscious disturbance may be an important predictor of poor short-term prognosis in patients with AE of non-neoplastic etiology. This work was supported by Liaoning Provincial Key R&D Program Guidance Plan (grant no. 2018225091).